Posted on May 5, 2012 by admin Posted in Android, Android Tips	. What is screen capture Android? Screen capture or often called screenshot is a feature to take photos or image of your phone screen. In the Windows PC, it is same as print screen. Screenshot is useful for example when you are playing a game and get a high score, then you want to show off to your friends; you can take a screenshot at the game score and show it to your friends or upload the image to the social networks, etc. Another example is if you want to take a picture of your text messaging conversation, emails, status on Facebook, etc. 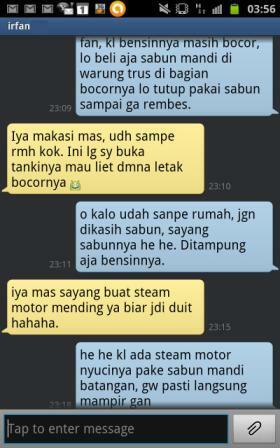 Below is an example of screenshot at the Android SMS application. Press the BACK button (inverted arrow) then the HOME/center button (without releasing the BACK button). If it successful, you will hear the shutter sound and the phone will vibrate. You can view the captured image from the Gallery, look for the ScreenCapture folder. If you want to view via file explorer (My Files), the resulted image stored on SDCard/ScreenCapture folder. Note: If it’s not working, try to press the BACK button for 1-2 seconds, and then press the HOME button while BACK button still pressed. Tags: how to do screen capture on galaxy mini, how to screenshot on samsung galaxy mini, how to take screenshot samsung galaxy mini, how to use screen capture on samsung galaxy mini	. Posted on April 29, 2012 by admin Posted in Android, Android Tips	. We recommend you to not store or carry your device in place that potentially blocking the signals. For example, deep in the thick bags, closed desk drawer, inside refrigerator :D, etc. Because if you put your phone in that place, it will cause the phone is always looking for signals and that process is drain battery fast. Use wallpaper, background, and themes with dark color. This method will improve Android battery life, but it’s only work in a cellphones or tablet that uses AMOLED screens. If this method used on non AMOLED screen, there will be no difference in the battery usage. To activate or deactivate Bluetooth or Wi-Fi can be done by pressing HOME Button > press the MENU button > click Settings > select Wireless & Networks > to turn it off, clear the check mark on the Bluetooth or Wi-Fi. 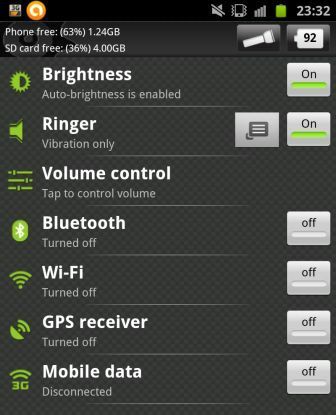 To turn off GPS can be done from Settings > Location & Security > uncheck the GPS and A-GPS (assisted GPS). Animation does look beautiful, but it use CPU that can drain battery. To save battery on Android, it’s better to turn off all animation, include the live wallpaper. To turn off animations can be done by pressing the HOME button > press the MENU button > select Settings > select Display > Click Animation > select No Animation. To save battery life on Android, its better if you remove widget that animate and also the one that use internet connection. For example, weather widget forecast is looks cool, but if you rarely use it, it’s better if you remove it because it will drain the battery. We suggest you to set 2G only connection whenever the signal condition in your area is not so good. For the record, if the connection is set to 2G only, the Android’s battery life will be more efficient, but the internet connection speed will be reduced. Therefore, if you want to download a large file, it’s better if the 3G connection is activated because if it still in 2G connection, the download time will be longer and it will draining battery more. By removing applications that you rarely used, it will free up phone memory space that will make the system work more efficiently thus will safe battery on Android. Less application also means fewer problems. If you rarely use the application but you don’t want uninstall it because you think someday maybe you’ll need that app and you don’t want to re-download the app, then you can back up the application first. For further information to backup Android Android application, you can read this article: how to backup Android apps (click here). The screen is one of the hardware that consumes battery a lot. You should set the screen time out as fast as possible and always to turn off the screen when it is not needed. Why we have to set the screen time out? Because when you carry your device on your pocket, there is a chance the power button is accidentally pressed and it will turn on the screen. Therefore, if you not set the screen time out, the screen will stays on and you not knowing it. If you not use it, you should log out from any applications that use services or background data. For example, if you use social networking apps such as Facebook occasionally and you don’t need active notification, then you should log out from your Facebook accounts. If you don’t do it, the apps will continually use internet connection on the background and it will consume the battery. If you already done using Android application, always click exit button from the app menu or always press the BACK button instead the HOME button to exit from the app. By pressing BACK button, in most case, it will completely terminate the app. But if you use the HOME button, the Android apps will run in the background and sometimes it’s still use the CPU (processor) thus drain the battery slowly. Below are some applications that I already tried that can prolong battery life. This app is actually not an Android battery saver application. 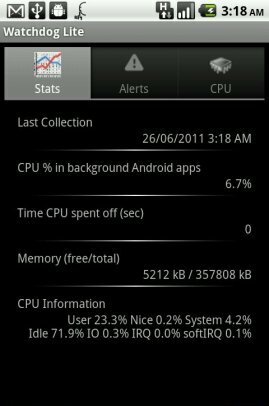 However, it is really handy to monitor Android application that running in the background. The function is to notify you every time some apps use CPU excessively. When there is one of the app use CPU more than normal, you will be informed immediately through the notification panel + vibration and you will be given the option to turn off (kill) the app, ignore it, or put it in a white list (you let the app use CPU as much as needed). If you know which applications that are often use CPU while running in the background, you can make the decision to remove (uninstall) the app to save your Android battery or you can keep it, but at least you know that apps is the one that drain your battery. Above picture shows that the 6.7% CPU is used by applications that running in the background. 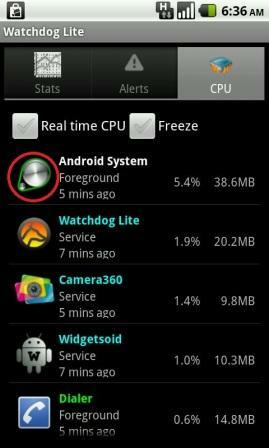 To find out what apps that are using CPU, you can simply click the “CPU” tab as below picture. You can also directly kill Android applications when you thing not necessary. However, if the application is running in the background but it doesn’t use the CPU, then it doesn’t need to be turned off. For further information about this matter, you can read: “Don’t use automatic task killer Android” (click here). Also, we suggest you to not turn off the “system” apps and also any apps that contain word “Google”. For example, you can look at the red circled apps in the above picture. Just for note, all the monitoring apps (just like Watchdog Task Manager) is using CPU a little bit, so if you already install this application and you don’t get notification at all for a long time, then you can uninstall this app. But, it you often installing many applications or just update it, then it’s better if you keep the Watchdog Task Manager to make sure you don’t have any bad application. This application is quite unique and pretty helpful in saving Android battery life. It has a function to activate auto synchronization only at the specified time. For example, you can set auto sync feature active every one hour for ten minutes. This means that every hour, Android phones will synchronize with Google server (or with any applications server) and after ten minutes the auto synchronization is turned off. You are free to determine when and how long you want to active auto sync. It also has a feature to automatically turn off internet connection if the phone signal in your area is weak. 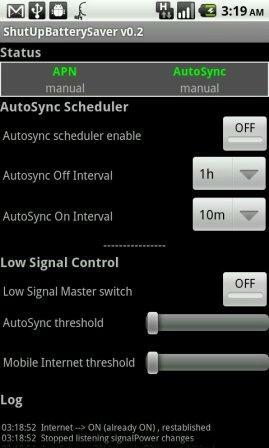 Autosync scheduler enable: click to activate or deactivate Auto sync scheduler. Autosync threshold: Sliding the bar to the right means more powerful signal. This means if you slide the bar full to the right, then if the signal just drop a little, it will turn off the auto sync. Mobile internet threshold: Slide to the right to turn off internet connection whenever the signal is bad. The side effects of using this application is you will be late receiving notification or data from any application that requires auto sync feature. For example, if there is a new email, you will get a notification at the next synchronization schedule. But in other hand, it will improve Android battery life quite a lot. Tags: best android battery saver, how to save battery on android, improve android battery life, saving battery on android	. Posted on April 1, 2012 by admin Posted in Android, Android Tips	. There are about three people asking me via the comments field on cellphone88.com about why every time they write long text message or more than three messages (more than 480 characters), the SMS converted to MMS. This happen not only when typing a new message but also when the user want to forward to another person. This condition is generally experienced by Samsung Galaxy series owner and of course it will be a little inconvenient and troublesome when the user wants to send long SMS messages to friends or relatives. Tags: long sms being converted to mms, sms converted to mms, sms converting to mms, stop sms converting to mms	.